Outbreaks of the defoliating pine butterfly are rare. In eastern Oregon, outbreaks occurred in 1908-11, 1940-43, 1982 and from 2008 to 2011. Sometimes defoliations can lead to mass mortality of ponderosa pine—the primary host, but not always. 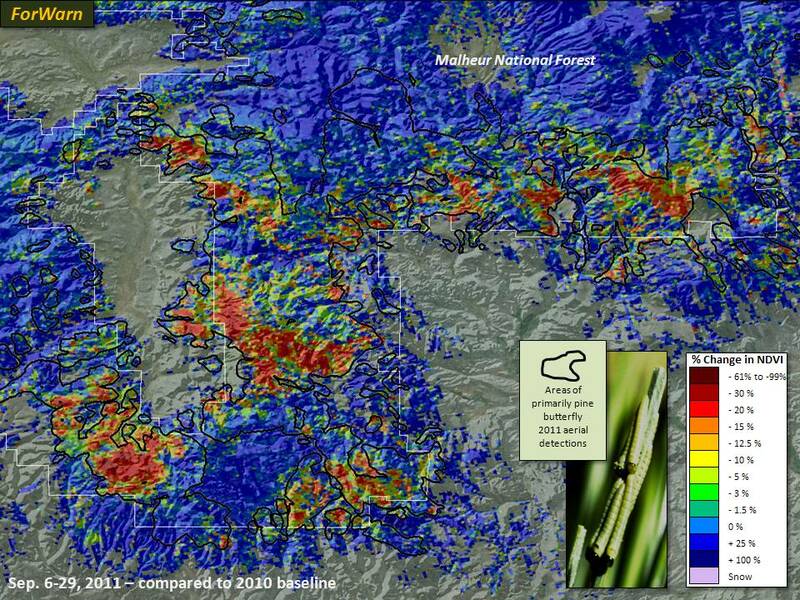 This current outbreak on the Malheur National Forest is largely responsible for the forest change anomalies in ForWarn for September 29, 2011 compared to 2010. According to aerial detection surveys, areas inside and outside these pine butterfly areas were also affected by spruce budworm.